Music composer extraordinaire Steve Jablonsky (who among many credits also does the music for Desperate Housewives and did the score for last year's hit movie Transformers, which longtime readers will remember this very blog going more than a little crazy about) gets interviewed by Music 4 Games about his work on Gears of War 2, due out next week. For Gears 2, the guys at Epic wanted every aspect of the game to be bigger, darker, and crunchier than the original game. And I guess they had heard some of these qualities in my film scores. I love writing for orchestra and choir, but I also love experimenting with electronics and different types of percussion. I basically use anything I can get my hands on when composing a large scale score like Gears. Epic gave me a blank canvas, which was really great. I experimented with a lot of hybrid organic/electronic elements, and combined them with the power of a large orchestra and choir. The one thing that we discussed keeping from Gears 1 was the Locust riff. It's a short aggressive rhythmic phrase that works really well in the original game, and they asked for my take on it. The rest of the material and themes are all new. Mike and Cliff made it clear that Gears 2 is bigger, meaner and even more insane than the original game. So I knew I had a big task ahead of me, and the music had to match the intensity of the game. Click on the above linke for plenty more. 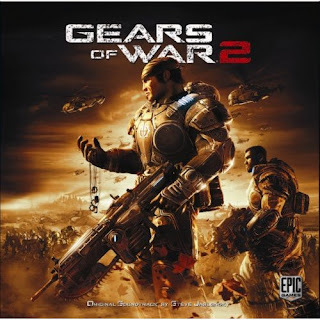 And Gears of War 2: The Soundtrack is due for release on November 25th. Thanks to Greg from Music 4 Games for the heads-up! The soundtrack from the first game was a real treat. I'm not quite so rue Jablonsky is the best pick for this, though. Jablonsky's style fitted Transformers like a glove. But Gears of War? It is much too dark and gritty for the use of techno. But maybe Steve will surprise us. It wouldn't be the first time a composer gave me a run for my hard drive space. Steve Jablonsky also did the soundtracks for The Island (which got a LOT of people paying attention to him), for Dragon Wars (originally titled D-War in South Korea), a bit of the first Pirates of the Caribbean movie and, fittingly, the remake a few years ago of The Texas Chainsaw Massacre. Personally, I didn't care for The Island score. Nothing really grabbed me. D-War had some good tracks - The Altar comes to mind. I never gave The Texas Chainsaw Massacre a listen. Minus Goldsmith's The Omen soundtracks, I never was a big fan of horror. In terms of the Gears of War 2 score, the promo was leaked. No surprise there. But the internet is pretty split. Some love it. Some hate it. I'll give it a download and see for myself later.